Imagine making scrumptious, healthy frozen desserts that are 100% fresh fruit. 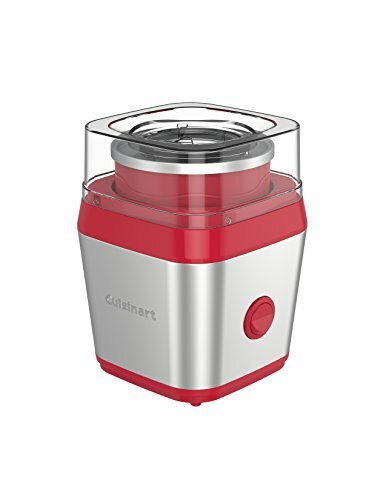 The Cuisinart Fruit Scoop Frozen Dessert Maker is designed with a unique paddle that crushes and freezes chunks of fresh, ripe fruit to create a variety of delicious frozen fruit treats - chunky textured to creamy smooth. A second paddle turns the unit into a genuine Cuisinart Ice Cream & Frozen Yogurt maker. The large spout on top lets users add fruit, ice cream and yogurt mixtures, or a combination of fruit and mixtures and fl avorings to provide an unending variety of frozen dessert and drink options. Churns and freezes a quart and a half in 18 to 25 minutes. Healthy, nondairy, fresh and fruity to totally rich, creamy and decadent, this dessert maker does it all.